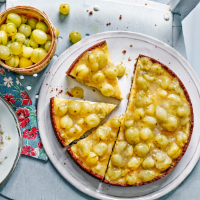 Tart gooseberries and fragrant elderflower are a match made in heaven. Using crushed ginger nut biscuits as a tart case instead of pastry is quick and easy; you could also use Hobnobs or digestives. 1. Preheat the oven to 180 ̊C, gas mark 4. lightly grease a 20cm loose-bottom sandwich tin. Put the biscuits in a food processor and whizz to fine crumbs. Add the butter and egg white and whizz again until the crumbs are coated. 2. Spoon the crumbs into the tin and, using the back of a spoon (or with your fingers), press evenly over the base and sides. Set on a baking tray and bake for 10 minutes. Remove from the oven, lightly press the base down with the back of a spoon to level and set aside. 3. Reduce the oven temperature to 150 ̊C, gas mark 2. In a small bowl, mix the gooseberry preserve with 1 tbsp elderflower cordial; spread over the base. 4. In a separate bowl, gently whisk together the crème fraîche, icing sugar and whole eggs until smooth. Gradually stir in the remaining cordial; carefully pour over the preserve in the tart. Transfer to the oven and bake for 40-45 minutes, until just set, with a wobble in the centre. Remove from the oven and leave to cool, then chill until firm, about 1-2 hours. 5. Meanwhile, make the topping. Put the gooseberries, sugar, lemon juice and 3 tbsp cold water in a saucepan. Gently heat until the sugar has dissolved, then bring to a simmer and bubble until the gooseberries are soft, but still retain some shape, about 3-4 minutes. Slacken the cornflour with 1 tbsp cold water, then add to the gooseberries and bubble for 1 minute. Set aside to cool, then chill until needed. 6. When ready to serve, transfer the tart to a serving plate. Spoon over the gooseberry topping and slice to serve. This recipe was first published in Tue Aug 04 15:48:29 BST 2015.